We may be able to convince our neighborhood grocer to participate! Come out to the market to buy some delicious, organic and fresh produce. Also hang out and talk to me and Yona. She is a great addition to the farm and extremely knowledgeable. She will give you great recipe ideas incorporating all of the farm produce. A great article on Brazilian city Belo- written a few years ago by author Frances Moore Lappe..
Philly can feed each of it’s residents.. One carrot at a time.. Be inspired. Philly can feed each of it’s residents.. One carrot at a time.. Many small scale farmers around the region were pretty terrified about the potential destructive forces of hurracaine Irene, myself included. However, I can happilly say that the damaged at our farm was minimal. A few downed sunflowers and row cover all over the place making the farm look like a haunted house. But for the most part the crops were undamaged. All of this rain, the wettest month in august on record, has not been kind to our peppers and tomatoes. The tomatoes have developed a fungus and as much as it hurts my soul I’m going to harvest the tomatoes, green and ripe alike, and pull out the plants. We have to cut our loses and use those 6 extra beds for fall production of greens and roots. We did cancell the market last week and I’m sorry to all of those you came out despite the weather. We appreciate your enthusiasm and support. 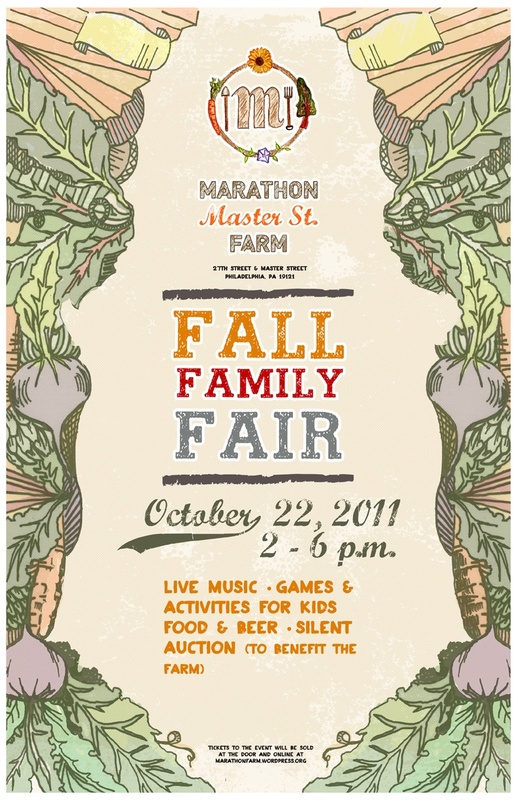 We will be out this saturday with the same great array of fresh, organic and North Philly grown produce. Also, I still harvested for the market and that all went to the restaurants so check out the daily specials at any of the marathon locations featuring produce from the farm. I hope to see you all at the next market and remember to come to our speaker series starting September 13th at the Marathon Grill on 10th and Walnut. More details are listed below. We are extremely excited to announce our new partnership with Mural Arts and their Restorative Justice Program. We just started working with the Murals Arts Restorative Justice Program. We are working with 15 high risk yound adults ages 18-24 who are either on parole or probation. The participants in this program will learn carpentry and other useful skills that will assist them in entering the local workforce and give them an oppurtunity to change their lives for the better. We will be working with this group weekly over the next 3 to 6 months to construct a wash station, storage facilities, a chicken coop, and a structure for an outdoor kitchen where we will host cooking and nutrition classes for the community. I will also use it to prepare food for local youth to get them eating well prepared and delicious fresh produce at young age. It a win win partnership where we receive help building great new infrastructure that will aid the farm in continuing to serve to community in new ways. while providing invaluable training for youths which can help them have a brighter future.